Avachinsky (2751m), one of Kamchatka's most active volcanoes, rises above Petropavlovsk, Kamchatka's largest city. Avachinsky consists of the Late Pleistocene edifice, destroyed by a large horseshoe-shaped crater, breached to the southwest, which encloses the Young Cone stratovolcano. The crater is believed to have formed about 30,000 years ago as a result of a huge debris avalanche, the deposits of which underlie the present city. 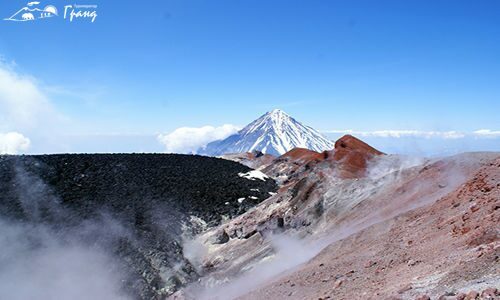 Avachinsky has been classified as a Somma volcano based on its similarities with Vesuvius. Avachinsky produced explosive eruptions with ash-falls and pyroclastic flows. The eruptive center at this time probably was presented by coalescent extrusive domes (similar to modern Young Shiveluch), nested in the Late Pleistocene debris avalanche crater. Ashes of these eruptions can be traced at a distance of more than 200-400 km. One of the initial explosive eruptions produced more than 4 km3 of basaltic andesite tephra which was dispersed at a distance of more than 300 km to the north and formed one of the main marker ash layers for this area. The Young Cone produced multiple explosive and effusive eruptions, the most recent in 1991 and 2001. Avachinsky has erupted at least 17 times in recorded history. Eruptions have generally been explosive, and pyroclastic flows and lahars have tended to be directed to the south west by the breached caldera. The most recent large eruption occurred in 1945, when about 0.25 km of magma was ejected. The volcano has since had small eruptions in 1991 and 2001. The volcano continues to experience frequent earthquakes, and many fumaroles exist near the summit. The temperature of gases emitted at these fumaroles has been measured at over 400°C. In light of its proximity to Petropavlovsk-Kamchatsky, Avachinsky was designated a Decade Volcano in 1996 as part of the United Nations' International Decade for Natural Disaster Reduction, together with the nearby Koryaksky volcano.